Since this table is for pricing you'll need to select Fee. Learn about content tables here. Choose Fee Type: You'll need to choose what type of fees you want to store in this table (eg: monthly, fixed, etc.). 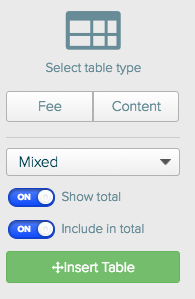 For a table that has different types of fees, choose mixed. 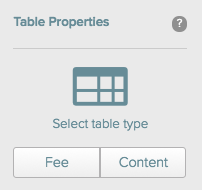 Show Total: If you want to include a total of all the fees in the footer of the table you can leave that turned on. If you'd rather not have a total, turn it off. You can change this later if you want to. Include in total: In most cases you want the fees in your table to be included in the value of the proposal. The total appears in your pipeline, metrics, and on the client preview. However in some cases you may not want the table to get added to the total value. 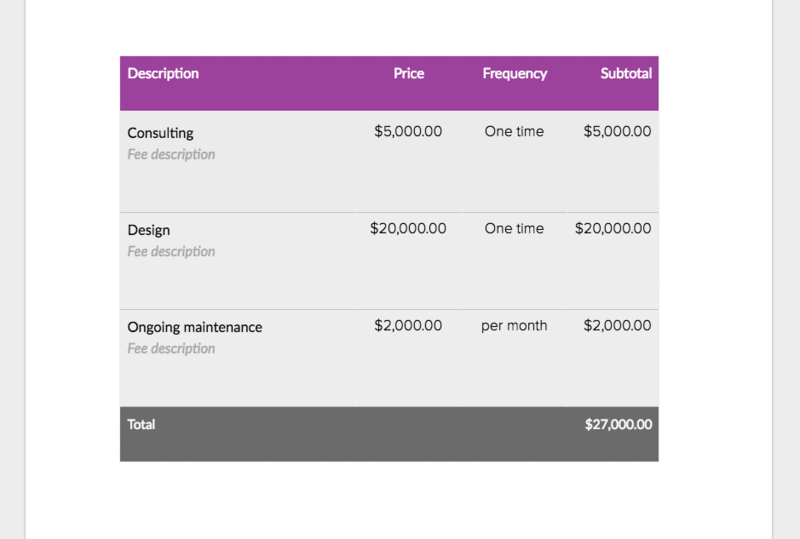 For example, if this proposal is going to be a summary table and you don't want it to double the cost of the proposal. If that's the case, turn off include in total. You're now ready to insert your table on the page. Click on Insert Table or simply click anywhere on the page and your table will get added. You can click in cells and add fee names, descriptions and pricing. If you double click within a row you'll see that you can drag the icon on the left to re-order your fee, moving it up or down. This also lets you add new fees to the table by clicking the + icon or remove the fee by clicking the trash icon. If you click within a row you'll see that row properties are now available to customize. If you edit a row the change only applies to the row you're highlighting, not other rows in the table. Editable quantity - Allows your client to choose how much of something they want to buy. Copy to fee library - Pushes that fee to your library. This is a one-time action. If you update the fee and then want to save it in the library, click the "Copy to fee library" button again.